The Natives Urban Areas Act of 1923 declared that blacks were temporary sojourners in urban areas and would only be permitted to reside there when employed. At the end of their working life they were to return to their homelands. The Act, intended to cover urban centres across South Africa, was rigorously applied by the Johannesburg Municipal Council (JMC). It provided the JMC with a legal basis to clear the inner city of what it considered insanitary areas. Between 1924 and 1931 the JMC issued eviction orders to blacks (individuals and families) residing in inner city slum yards to vacate these areas. These were contested in the courts, who ruled the eviction orders illegal if the JMC did not provide alternative accommodation to those affected. Early in the 1930s, with the Great Depression lifting and the mining industry revitalized, the JMC was able to raise revenue to undertake a housing programme. This resulted in the establishment of Orlando Township in 1932. Slum clearance in the inner city of Johannesburg began in earnest in 1932 and was completed in 1937, when residents of Prospect Township were relocated to Orlando. It soon became apparent that the number of houses provided by the JMC in Orlando was inadequate to cover all slum residents forced out of the inner city. Some sought accommodation in the freehold townships of the Western Areas. These included Sophiatown, Newclare and Martindale. Others opted to sublet in Orlando, becoming subtenants. The number of subtenants grew steadily in the second half of the 1930s, increasingly sharply during World War II. Historically, one way governments responded to a surge in the number of people migrating to the urban centres was to tighten influx control regulations. Restricting the number of people entering a township was achieved through the application of location regulations promulgated under the Native Urban Areas Act of 1923. The outbreak of World War II and the conscription whites into the army created a demand for labour that could only be met by blacks migrating to the urban areas. With influx control regulations in place, the number of blacks allowed to enter Johannesburg was restricted. In order to attract a large pool of labour, influx control measures needed to be removed. In 1942 General Smuts’ United Party (UP) government passed the War Measures Act, which included the lifting of influx control regulations to meet increasing demand for labour. This allowed tens of thousands, mainly families, to migrate to the cities, and to Johannesburg in particular. Consequently, Orlando’s subtenant population grew exponentially during this period. And yet, the UP government was reluctant to build more houses to accommodate the growing number of subtenants. By the end of the war in 1945, overcrowding in Orlando had reached crisis proportions. Typically, subtenants were relatives of resident families in Orlando, living in hastily constructed backyard shacks. The Sisulu family home in Phomolong Orlando West was one of those where relatives moved in. As Walter Sisulu recalled, his two roomed house had relatives staying with him. In this two roomed house Sisulu accommodated his uncle’s family, including his cousins. And probably in these instances tensions were rare and where they surfaced could be amicably resolved. In other cases families accommodated complete strangers, increasing the possibility of tensions and conflicts between hosts and subtenants. This gradually led to animosity between Orlando’s legitimate and legal tenants and their subtenants. It was into this potentially explosive environment that the self styled messiah, James Sofasonke Mpanza made his impact. Originally from Natal, and with a history of murder, Mpanza converted while in prison. When released he became a lay preacher and leader of thousands of disgruntled subtenants in Orlando. 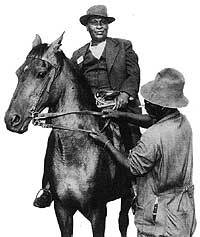 Mpanza established the Sofasonke Party which took part in elections to the Native Advisory Board. Mpanza added his voice to the appeal for more houses to be built. When the JMC ignored these appeals, Mpanza decided to take drastic steps. In March 1944 Mpanza had become disillusioned with peaceful appeals for more houses and called for a more daring approach to force the JMC to heed the subtenants’ demand for houses. Perched on a horse Mpanza led hundreds of subtenant families across the railway line to vacant land in what is today Orlando West. Mpanza and his followers, members of the Sofasonke Party forcibly occupied the piece of land and erected fragile structures made of sacking material. Because of the sack material used to erect the structures, the camp became known as “Masakeng”. The group, appearing belligerent and menacing, adopted the slogan “si ya o ghoba si ya o ghebula umhlaba ka maspala”. (This translates to “we are digging and we are seizing municipal land. The slogan was later adopted as a war song by Orlando Pirates, a soccer team formed in the township in 1937). Mpanza’s action was directed at the JMC. He had hoped that the forcible occupation of land would force the JMC to undertake a housing programme and provide his supporters with accommodation. The JMC remained steadfast in its refusal to expand the township’s housing programme. However, it was the CPSA and the ANC that condemned Mpanza as an opportunist using his supporters for his own nefarious ends. 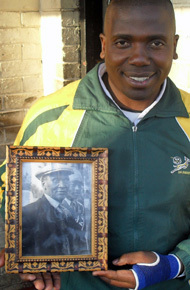 Mpanza became a tyrannical administrator of the camp, collecting rent and presiding over cases to prosecute those accused of criminal offenses. The ANC and CPSA continued their condemnation of Mpanza in successive Advisory Board meetings. Mpanza responded to this criticism by threatening ANC and CPSA members with violence and at one stage locked them out of the Orlando Communal Hall, the venue for Advisory Board meetings. Masakeng was condemned as a health hazard. During winter and rainy seasons the hessian sacks used to erect the structures exposed residents to the elements. Considering that many of the families had children and infants, the mortality rate at Masakeng became unbearable. This and Mpanza’s excesses in administering justice and possible embezzlement of funds flowing from exorbitant rentals he charged residents became the hub of ANC and CPSA criticism of Soweto’s messiah. The JMC responded more creatively to Mpanza threat. It established a site and service scheme in Moroka, attracting hundreds of home seekers. The site and service scheme was provided with water and other amenities and was laid out more neatly than Masakeng’s hastily constructed structures. And as the Moroka site and service scheme grew in popularity, hundreds left Masakeng and headed there. Alongside Mpanza’s squatter movement others emerged in other parts of Johannesburg. In Pimville, Abel Ntoi led a group of followers who also occupied municipal land following the JMC’s reluctance to build more houses. In Newclare west of Johannesburg, yet another squatter movement emerged, demanding houses for tenants and subtenants of the freehold township. Many of those in Ntoi’s squatter movement opted for the JMC’s site and service scheme in Moroka. The emergence and growth of sites and service schemes marked the end of squatter movements. By 1947 squatter movements had run their course and the country’s attention was drawn to the upcoming general elections in 1948. The election was contested on a number of issues, including the most desirable measures to be adopted to stem the tide of urban migration by black people. The Nationalist Party (NP) under D. F. Malan promised to bring back influx control regulations, and to tighten them and restrict the number of black people entering the urban areas. The NP emerged victorious in the elections and formed a government based on the principle of apartheid. The apartheid government passed a number of laws, institutionalizing racial segregation. These included the Group Areas Act of 1950, which provided for the removal of “black spots” in areas adjacent to cities. It is under this piece of legislation that Sophiatown was destroyed and residents resettled in Meadowlands. In 1952 the NP government passed the Native Laws Amendment Act which prohibited rural migrants from moving to urban areas. In the meantime, the site and service schemes proved to be more enduring than Mpanza’s Masakeng. Living conditions in the site and service schemes remained appalling. The Council for Scientific and Industrial Research (CSIR) was commissioned to draw up a plan of the type of houses that could be provided for Soweto’s population. The CSIR produced a standard design for a four-roomed house of 40 sq m, known as the 51/6 plan. The plan was implemented in Soweto from 1955, providing a serviced site and allowing occupants to erect shacks until the formal house was built. It is from these initiatives that, by the end of 1956, the townships of Tladi, Zondi, Dhlamini, Chiawelo and Senoane had been laid out. These were followed in 1957 by the establishment of new townships of Jabulani, Phiri and Naledi. Many of the temporary shelters in Moroka and Orlando were now cleared. It is significant that the JMC (renamed the Johannesburg City Council or JCC) was dominated by the UP. The UP was reluctant to implement policies of the NP in Johannesburg, and always sought alternative ways of housing the black population under its jurisdiction. One of its strategies was to approach business to help with the provision of housing for black people in Johannesburg. 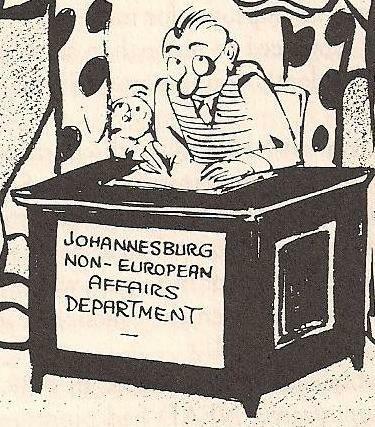 It was against this backdrop that JCC’s manager for Native Affairs, W. J. P. Carr invited Sir Ernest Oppenheimer to Soweto to see the appalling conditions. He was so moved that he arranged for the mining sector to provide a £3 million loan from the mining houses for the construction of houses and as a result a massive construction programme was launched. The Minister of Native Affairs, Dr. H. F. Verwoerd reacted angrily to these developments. Verwoerd accused Carr of failing to report that the conditions attached to a £3 million loan granted by the mining companies were not being met. But the JCC continued to administer black townships in Johannesburg independently of the central government, to the NP’s annoyance. It was only when the NP established the Native Resettlement Board (NRB) that it managed to bring some of Soweto’s townships under the jurisdiction of the central government. And for the first time in 1972, all of Soweto’s locations were brought under central government control, establishing the NP’s hegemony over the entire group of townships. Within 4 years of this development, the Soweto Revolt broke out in June 1976. Squatter movements in Johannesburg’s black townships in the mid 1940s have played a key role in the development of the geographical and political landscape of the area. Yet their role has been largely overlooked. It is apparent from these developments that the impulse to seize municipal land to provide housing by residents has a historical precedent. In recent years the emergence of squatter camps or informal settlements has been widely documented. Yet, the historical origins of squatter movements remain largely unaccounted for. • A. W. Stadler, Birds in the Cornfield: Squatter Movements in Johannesburg, 1944-1947,Journal of Southern African Studies,Vol. 6, No. 1, Special Issue on Urban Social History. (Oct.1979), pp. 93-123. • French, K., Father of Soweto, Viva Books, (Cape Town), South Africa.